When it was first released in 1960, Psycho was scaring the living hell out of film goers the world over. Hitchcock’s ability to create suspense and tension Since then, Psycho has grown into a cult classic and has been hailed as Alfred Hitchcock’s cinematic masterpiece. The shower scene alone has firmly anchored itself in pop-culture. The Australian arm of the NYX production company, NextGen Gaming, have jointly released an adaption of the Hitchcock masterpiece. As with all NYX/NextGen games, the subject matter is treated respectfully and accurately recreated. This online pokie recreation is almost as chilling and full of suspense as the original film. 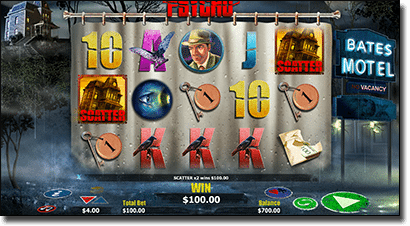 Psycho is a five reel, 25 pay-line pokie with a minimum bet of $0.50 and a maximum bet of $100. This variance between minimum and max bet is ensures that all punting abilities are catered for, which is great to see. Freedom to punt how you like is pivotal these days. The entire feel of Psycho is much like the movie: tense and chock full of suspense. The playing screen is based on a shower curtain which is centred between the Bates Motel and the house on the hill. The tension of the game is enhanced by the minimal, haunting strings in the background as well as the odd crack of thunder. The payout of symbols runs as follows in descending order. Any five scattered house on the hill symbols wins the largest pay out. Five wild symbols is the next most valuable, followed by Marion Crane’s symbol, Arbogast the detective, Bates’ eye to the peek hole and the cash in the envelope, the room key, Ace, King and Queen, Jack and 10. The Wild symbol is a great device in Psycho because any wins with the Wild symbol can randomly be multiplied by x2, x3, x4, x5, x10 or even x20 during paid plays. This is compounded by the fact that Psycho Wilds can be randomly triggered during any game. The Psycho Wild can appear in two different forms. First, just an errant arm slashes wildly at the playing screen with a butchers knife. The other Psycho Wild form is Norman Bates pulling back the shower curtain, which is the backdrop for the playing screen, and stabbing the symbols. In our experience, you tend to get awarded more wild symbols when the shower curtain is pulled back rather than just the arm with the butchers knife. 10, 15 or 20 free games can be triggered by spinning up any three, four or five scattered house on the hill symbols. During free games, there are more wild symbols in play as well as more Pyscho Wild’s. This is again enhanced by the fact that all wild’s are randomly multiplied by x2, x4, x6, x8, x10, x20 and a mammoth x40. On top of that, the free spins can be re-triggered during your free games to award more free games. Your free games will come to an end with blood swirling down the shower drain, just like the aftermath of Marion Crane’s grisly murder in the film. After every win – no matter how small – you have the option to gamble. You have the options of black or red, which has a return of 2/1 or you can choose Heart, Diamond, Spade or Club and if you choose correctly you get a return of 4/1. Of course, if you choose wrong, you lose the entire stake that you have gambled. All in all, NYX’ Psycho is a great game that is well rounded and does a more than adequate job of recreating the base material. As the online pokie market balloons with movie re-makes, Psycho has cemented itself among the best of them.